In Mali, the youth represent a high percentage of the voting population. The youth today in Mali are besieged by the many failures of their country. To start with, many children are born into poverty. Despite the government providing free primary education, the existence of middle schools in their local areas is rare and high schools even rarer. If children even graduate high school, their next challenge comes in terms of finding a college/technical school close by. Most colleges/technical schools are located in the big cities like Bamako and Sikasso. All through these important years, the children also face the problem of overcrowded classrooms and teachers who do not have the adequate skills/training to teach. These issues apply to college level as well. In addition, corruption is rampant and a degree is easily bought. The result is a workforce that is ill-equipped to handle the growing economic need. The need for educated, well trained individuals is barely met, making companies hire graduates from the surrounding West African countries. Mali’s reported unemployment hovers dangerously at 35% with the real number being even higher. So it isn’t surprising that the youth are big stakeholders in the upcoming Presidential elections. One of the things that the new President will need to resolve is the immediate employment need and also the long term human resource quality. This will involve big investments in education and infrastructure building. In the Samaké campaign, the youth are an essential bloodline of our success. The youth see Yeah as a bright flame in their bleak future. They see the success that can come from hard work. They are inspired by all the things that Yeah has accomplished for Mali like building schools and bringing clean water and electricity to his community of 53,000 people. In Mali politics, there is not one leader currently who can list more than two things he has done for his people. Yeah, on the other hand, can talk about education, healthcare, clean energy and clean water, as he has made big impacts in all those areas. So the youth are attracted to the man who practices what he preaches. 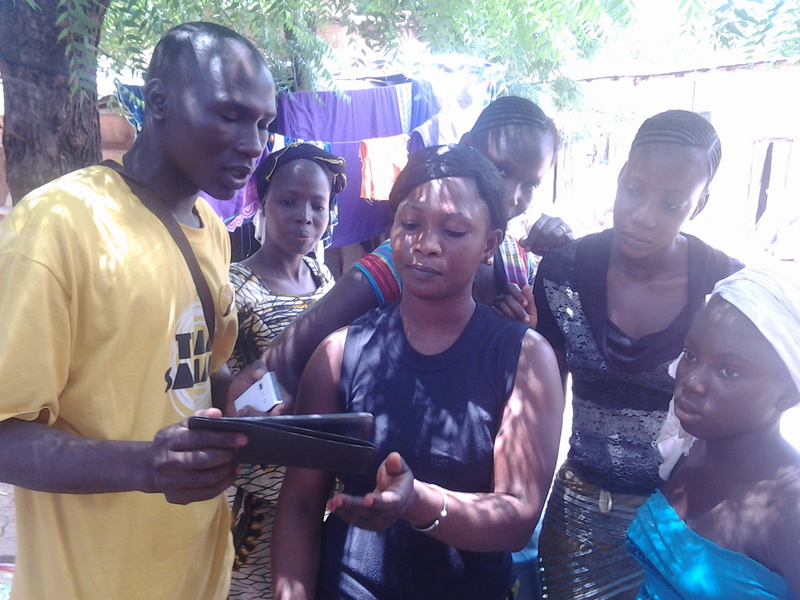 It is in this energy that our youth bureau has been spreading the Samake message in the different regions of Mali. This past week, 10 members of the “Voices of Change” used notebooks and traveled to the different communes of Bamako to spread the Yeah Samake message. They each share the video about Yeah that they compiled and talk about the politician that is a doer. These guys are pumped up and I have been so impressed with their commitment. In a day and age when our teenagers like to sleep in on the weekends, these youth are gathering for meetings at 7am. They work constantly for more than 8 hours a day without complaint. Their commitment encourages me each day to fight a little harder. They are bigger stakeholders in Yeah’s success. This coming week, in conjunction with the newest school we were inaugurating, the youth visited the Sikasso area. Here they did a similar grassroots movement educating men, women and youth about Yeah Samake as the candidate that could bring much change and opportunities to Mali. The response to the youth group has been amazing. The people of Mali are so tired of the change that has been promised and never delivered for the last 20 years. It is time that the page be turned on the old generation and old ideas. 20 years has proven that they do not work. If change does not happen, Mali will continue to be condemned to 5 more years of ineffective leaders and corrupt practices. The youth will continue to be brushed aside and the unemployment and illiteracy will only get out of control. Today, I am asking for your investment. It’s not too late to join the fight for Mali. The youth have been marginalized long enough with lack of opportunities and mediocre leadership. Yeah and I are committed to fight this election to the end. However, we need your investment to help us end with a gusto. The youth of Mali deserve the chance to be given the opportunity to change their destiny. They can only do this if the opportunity exists. Yeah truly understands how to create opportunities. All the projects like the water pumps, clinics, schools, hospitals, and solar field have brought many opportunities and economic development to his area. Working with the previous government, he was even able to reopen one of the 5 cotton plants in Mali. His track record resounds with the youth. Today invest in the youth of Mali and their future by donating to our campaign for Mali. The old leaders of Mali have profited of Malians and are counting on Yeah to fail. Do not let them win! This journey would be impossible without your help, prayers and guidance. Donate today at http://www.samake2013.com or share this message with friends/family/acquaintances that can help Mali. Together we can build a stronger Mali.